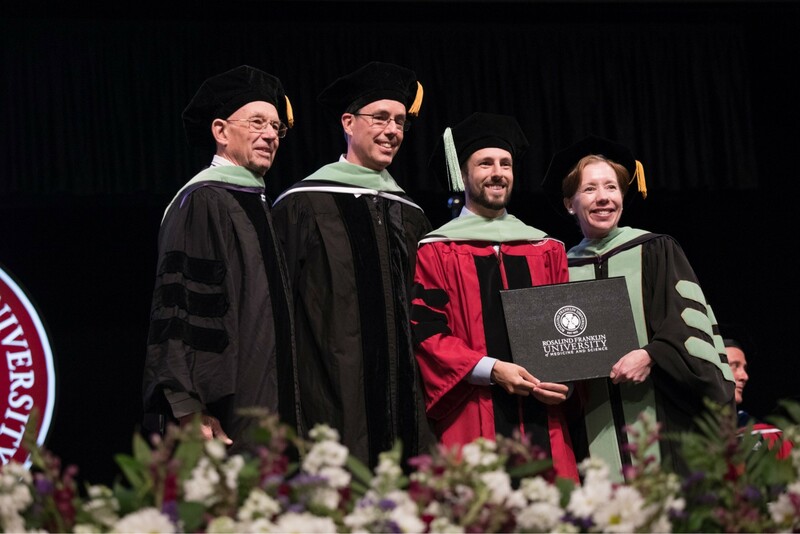 From left: Reno Caneva, DPM '59, Daryl Caneva, DPM '88 and Andres Caneva, DPM ’18, with Nancy L. Parsley, DPM ’93, MHPE, dean of the Dr. William M. Scholl College of Podiatric Medicine. 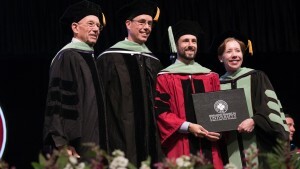 Three generations of Dr. William M. Scholl College of Podiatric Medicine alumni gathered on stage at Rosalind Franklin University’s 104th Commencement on June 1, when graduate Andres Caneva, DPM ’18, was hooded by his father Daryl Caneva, DPM '88, and his grandfather Reno Caneva, DPM '59. That next step is three years of residency training at Presence Saint Joseph Hospital, Chicago. The youngest Dr. Caneva, who earned a bachelor’s in biology from Northwestern University, is considering joining his father in private practice. Dr. Daryl Caneva, who took over the practice founded by Dr. Reno Caneva, with offices in the family’s hometown, Lockport, IL, and Joliet, IL, said he and Andres frequently talk shop. It’s really a testament to the quality of the Scholl College education and its affiliation with Rosalind Franklin University, which really expanded the college’s horizons. Scholl College joined RFU in 2001. The elder Dr. Caneva attended when it was located in Chicago. It was the Illinois College of Chiropody and Foot Surgery when Dr. Reno Caneva labored to accumulate 1,200 hours of clinical practice in the college’s renowned foot clinic, which he recalls attracted nearly 50,000 patient visits per year. Dr. Caneva studied on his own and with colleagues for 16 years to gain hospital surgical privileges. True to the national reputation of Scholl College alumni, he was a leader in the profession, establishing a podiatric residency at hospitals in Ottawa, IL, and Joliet. The Caneva family can count six generations of keen interest in the lower extremity. Dr. Reno Caneva’s father, who owned a shoe store, urged him to attend Scholl College. His grandfather and great grandfather made and repaired shoes. Two more family members are taking the arduous path to a podiatric medical degree. Roberto Caneva, Andres’ brother, is a second-year student at Scholl College. Zachary Trent, a first cousin, arrives on campus in the fall.